Today I’m loving … this rustic piece of wood that is being used as a pan coaster. 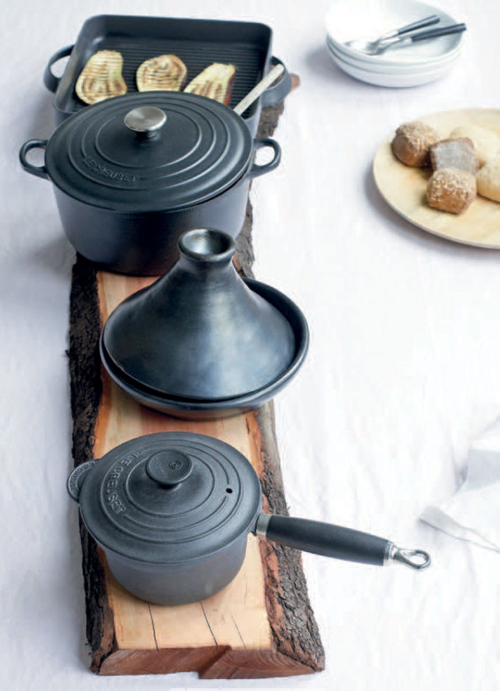 Loving the black cast iron Le Creuset pans as well! I LOVE my black cast iron – I have ruined several Le Creuset so now stick to ordinary cast iron which is indestructible, and will look just as good on wood – thanks for the tip! I love this – what a great way to add a rustic look to a place setting! I love this! This is a wonderful idea for a rustic dinner setting… perfect for serving a hearty stew.